Attracted at first by the cool, refreshing water, visitors find other unexpected rewards. The quiet, stark beauty of the Mojave Desert with its dramatic exposed geology and the suprising abundance of specially adapted plant and animals offers a variety of experiences for everyone. Lake Mead National Recreation Area is a startling contrast of desert and water, mountains and canyons, primitive backcountry, and busy marinas. Dams that back up the Colorado River as it flows through one of the hottest, driest regions on earth created Lake Mead and Lake Mohave. Established as America's first national recreation area, it is a destination for millions of visitors who flock to the desert for boating, fishing, swimming and water-skiing. 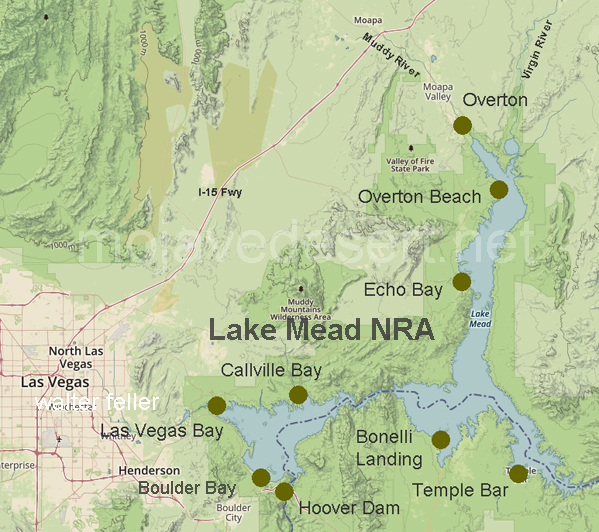 Before the existence of Lake Mead, Lake Mohave, and Hoover Dam, the area encompassing the one and half million acres of the Lake Mead National Recreation Area was occupied by early desert Indian cultures, adventurous explorers, and ambitious pioneers looking for cheap land and religious freedom, and prospectors seeking riches. Based on archaeological evidence, several Native American cultures have been identified as having existed 8,000 to 10,000 years ago in an environment wetter and cooler than it is today where they hunted game, gathered local edible plants, and practiced farming. In a cave near present-day Lake Mead, the remains of large mammals were discovered by archaeologist, Mark R.Harrington and paleontologist James Thurston including: ground sloth (Nothrotheriops shastensis), horse (Equus sp. ), camel (Camelops sp. ), and mountain sheep (Ovis canadensis). Notches found on the bones of animals located in that primitive dwelling show evidence that they were prepared and eaten by humans. Various prehistoric culture groups made the Colorado River region their. Archaeological investigations have provided evidence that some were hunter/gatherers and lived in caves; other groups lived in pit houses and Puebloan-type structures, and practiced early farming. Ranging from present day Davis Dam north to the Virgin and Muddy Rivers, these early farming groups grew corn, beans, squash and cotton. Their technology included pottery of the reddish-brown and gray-brown buff ware with simple black and red decoration; they ground corn and seeds with manos and metate and hunted game with spears, bows & arrows made from local or traded materials. Early Explorers traveling from Utah to California crossed through the region over land and water. In search of areas rich in animal furs for trade, Jedediah Smith traversed the Virgin and Colorado rivers in 1826 and 1827, encountering the early Indians who lived along the river banks. In 1855, Lt. Joseph Christmas Ives traveled the lower Colorado River in search of safe and efficient passage upon the steamship, Explorer. Following Ives, John Wesley Powell continued exploration of the upper Colorado River from the Grand Canyon to where it meets the Virgin River. Powell became a noted historian of the region. The southwestern desert with its arid environment was a most inhospitable environment in which to live. For centuries the early native inhabitants living along the Colorado River found innovative ways to irrigate small agricultural plots. The region became more and more populated by white settlers with the advent of rail transportation and the discovery of gold and silver in the mountains of southern Nevada. Mormon pioneers established communities and prospectors established mining claims up and down the river. Visionaries desiring continued westward expansion sought to discover ways to harness the power of the river to allow for large-scale irrigation and other industries. Thus, the concept of building a dam was born. The Reclamation Act of 1902 thus instituted, the construction of Boulder Dam, later to be named Hoover Dam, began in 1931. The reservoir created by the damming of the Colorado River became Lake Mead, named after Elwood Mead, the Bureau of Reclamation commissioner at the time. The newly formed lake drew thousands of visitors to this wondrous contrast of desert and water. 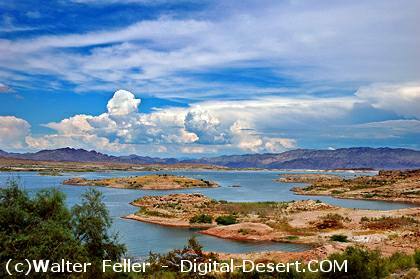 Lake Mead National Recreation Area became the first national recreation area in 1964. Today, millions of visitors each year come to enjoy the many recreational opportunities found within the park�s diverse landscape.